Phase contrast microscopy imaging techniques allow normally clear transparent blood cells to appear with increased contrast. This gives the advantage of seeing greater surface detail. Differences in refractive indices of the specimen alter the phase of the light waves. This phase shift is translated into differences in light intensity, effectively allowing better viewing contrast. In live blood cell analysis, phase contrast microscopy is best used to understand and view the effects of improper nutrition and problems in the body. It allows excellent viewing of the general contour of the blood cells in a manner not possible with other techniques. However, it does not illuminate the fine details as seen in darkfield. It generally is not used to determine the root cause of the body’s problem. Darkfield microscopy imaging techniques provide a method to view features in blood not normally shown with phase contrast and brightfield illumination. This method illuminates the specimen from the side, not from behind, so the background is black. Minute features of the blood are shown in a glowing light as it reflects off their surfaces. 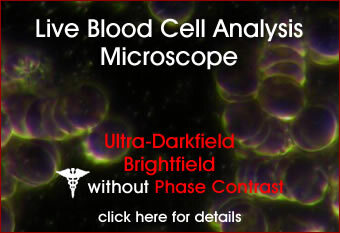 In live blood cell analysis, darkfield microscopy is best used to view and understand the results of improper nutrition and problems in the body. Some evaluations are done solely using phase contrast or even using only brightfield, but they are missing a whole spectrum of enlightning information that can only be viewed in true darkfield. Brightfield microscopy imaging techniques are used in dry layer blood analysis. Light is transmitted through the specimen, and the resulting image is clear and bright. Although it is an excellent technique for examining dry blood, it fails to provide the images in live blood that are necessary for a proper evaluation. All Images taken by our technicians using our Live Blood Labs microscopes. Beware of what others sell. Many sell systems that do not have a 350 Watt illumination source. Although their optics may be sufficient, their illumination is not. 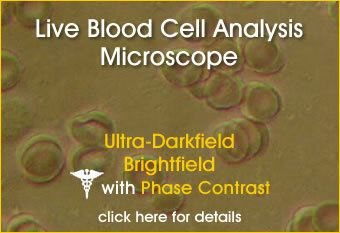 They will not produce the quality imaging needed for ultra darkfield live blood cell analysis. 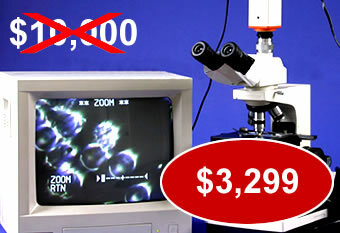 Unless you know a lot about darkfield microscopes, you will not be able to sit down and attain the quality level you need. We will provide you free phone support. From our experience, most customers need assistance from us to attain high quality darkfield images with their microscopy equipment. We work with you after the sale to see that your needs are met. Quality Shows in our Photography! Enough about telling you we have a quality system. Have you ever seen someone selling something and call it a “Low Quality” system? Words are cheap, but a picture tells it all. Look at the photos taken using this system. These photos were captured using a Sony Digital Camera mounted to the top of the scope. 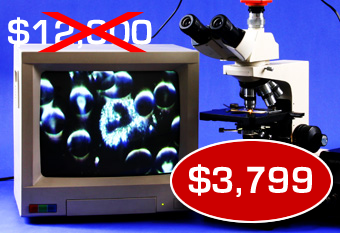 This clearly demonstrates the optical quality of this darkfield live blood microscope system. Most importantly, the quality of the 350 Watt Illumination system, the Darkfield Iris Objectives, and the Oil Immersion Darkfield Condenser are all put to the test. We have compared our photos to the photos of other professionals in the field, and have found ours to be equilivalent or superior. The best method to answer questions about quality is not through words, but pictures. We trust that these photos convince you of the superior capability of our system. Copyright © 2005 LiveBloodLabs. All photos, style, and text are copyrighted by LiveBloodLabs. Any unauthorized infringement will be pursued with legal action.